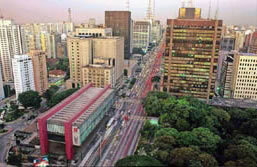 São Paulo is the most cosmopolitan city in Brazil, and the most important commercial, industrial, and economic center in South America. Only a few years ago, Sao Paulo was referred to as Latin America's fastest growing city - and today it is already the largest on the continent. Forty percent of Brazil's industrial output is generated by Sao Paulo's industries. Located in Brazil's cool highlands, the state of São Paulo has fertile soil, which produces almost half of the nation's fruit and vegetables, cotton and coffee. Huge industrial complexes surround the city: steel mills, chemical plants, automobile assembly lines, timber, paper, and textile mills - and concrete ribbons of highways lace the city to the countryside. In addition to these regular excursions from São Paulo, we also offer a series of Special Interest Tours in the state of São Paulo.